The Document Management Group are able to offer clients a Cloud Based Document Management Solution, which is ideal for businesses small or large that wish to have their data held off-site. Maybe you wish to store data in the cloud so the data can be accessed from anywhere but without the need for expensive or complex VPN and office network infrastructure that would be required to hold the data on-site with remote access? 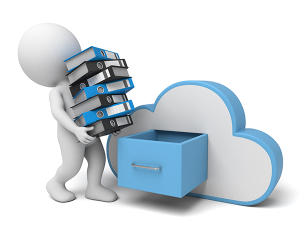 Our cloud based document management solutions are designed to operate and behave as though the document management software and the documents stored inside are all located on your own local PC. Click on the below options to see more information. Based on the very successful Small Business and Enterprise class Document Management software, FileDirector, comes FileDirector Cloud. Supplied with all the optional features included, your business simply pays a set monthly fee and gains their own FileDirector Cloud Server solution hosted by Spielberg on Microsoft’s Azure Server platform held in a Microsoft data centre. Businesses simply need to subscribe to Therefore™ Online, and they will benefit from an all-inclusive solution. This means that there will be no limits on the amount of users that can be added, there will be unlimited Workflows that you can have configured and the support costs are inclusive with the subscription. This results in a cloud-based document management solution that is suitable for companies of any size that want to benefit from the optimising of how information flows throughout their business, yet don’t wish to invest in the capital or expertise to maintain their own internal IT infrastructure. Please leave us your details below, along with a brief description of the requirements you have.